Pyrus calleryana - Winter Glow is an attractive ornamental pear has become a popular screening plant as it retains its foliage for most of winter. It is sometimes marketed as an evergreen pear, but more technically it is semi deciduous and retains its leaves only in temperate climates. This is the case in most Melbourne gardens. 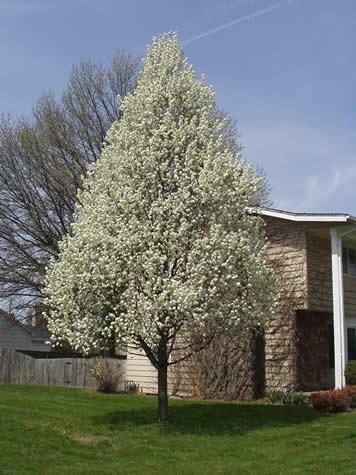 EverScreen Ornamental Pear, as it is sometimes called, has an upright pyramidal shape this is combined with its year round foliage that makes it a great ornamental pear to select as a tall fast growing screen. Tolerances: Adaptable to a wide range of site conditions including quite dry conditions, slightly alkaline soils and air pollution. Able to handle intermittently wet, heavy soils. Best in full sun. Landscape use: This is a lovely specimen tree, as well as a great driveway and avenue tree. Pyrus calleryana - Winter Glow can be used effectively as a hedging and screening plant.